Cream together sugar and butter; beat in egg, yolks and vanilla extract. Add flour; mix thoroughly. Stir in cherries. Divide dough in half and place dough on sheets of waxed or parchment paper. Using waxed paper or parchment paper and your hands, carefully shape into two rolls, 1-inch by 12-inch. Wrap in freezer wrap. Place rolls on cookie sheet and freeze until ready to bake. Peel paper off cookie rolls. Slice cookies into 1/4-inch slices and place on cookie sheet. 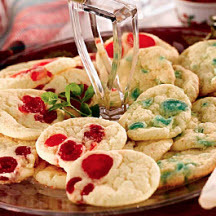 Bake cookies in a preheated 350°F (175°C) oven for 12 to 15 minutes or until lightly browned. Tip: May also add 1 cup chopped toasted nuts to dough if desired. Nutritional Information Per Serving (1/36 of recipe): Calories: 95; Total Fat: 3g; Total Carbs: 15g; Protein: 1g; Sodium: 161mg.